Director Eugene Jarecki (right) presents a check for $25,000 to the Stax Music Academy, represented by Tim Sampson (left). The money came from the sale of Elvis Presley's Rolls Royce, which was used in the new documentary film The King. Last night, Director Eugene Jarecki was in Memphis for the theatrical premiere of his new documentary film The King. I sat down with him at Cafe Keough over milk and cookies for a freewheeling discussion about his film. The following conversation was edited for length and clarity, because we talked for a really long time. Once upon a time, we were making a film without a car. It was just a poetic reflection of Elvis and America. Then his car came up for auction in Pebble Beach California. How long had you been working on the movie at that time? About a year. I thought, who could possibly say no to the chance to make a great American road movie in Elvis’ own car? I already wanted to travel the country and meet musicians and people who loved him. Now I could do it in his style. I could follow his footsteps in a ghost car. So I went to the producers and asked if we could find it in the budget to buy the car. They said they would only do it if we could sell the car when we were done—as long as I didn’t wrap the car around the tree or drive it off the grand canyon. I almost did on several occasions. But we lived to tell about it, and I’m proud to say that we did, in fact, sell the car to the Seminole Indian Nation in Florida. They have bought the failed Trump Taj Mahal casino in Atlantic City, New Jersey. On that site, they have built the new Hard Rock Hotel and Casino. Elvis’ Rolls will, in perpetuity, be the centerpiece. They are projecting images from the film all around the car to tell the story of the extraordinary journey to the hard rock from Elvis’ life. One of the requirements I had, because we wanted to give love to Memphis, and an institution in Memphis that we believe in. 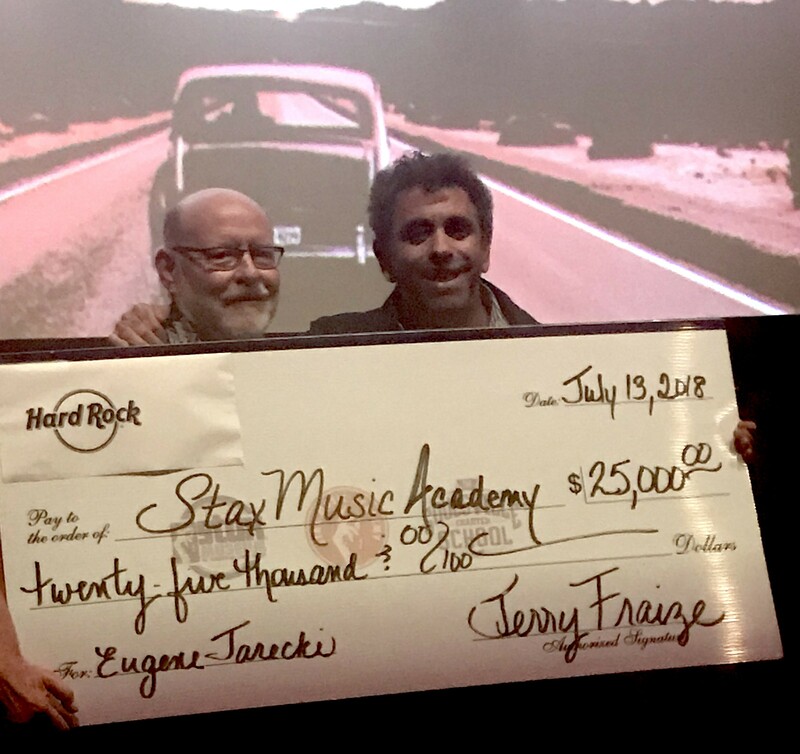 Hard Rock and myself agreed to give, as a part of the sale of the car, a donation of $25,000 to the Stax Music Academy. I hope to bring attention to things in Memphis that are fighting back against the very things that are hurting the country. You see pockets of amazing ambition, idealism, and care going on here. Nowhere is that more true than Stax. I also think it’s very poetic for Elvis, in death, to give back to the black community in Memphis. I saw the film at the Indie Memphis screening, and I was frankly expecting another Elvis hagiography. It’s not like that at all. It’s a really deep, meditative kind of movie. We didn’t set out to make a biopic. That’s for others to do. I think the Memphians I spoke to are tired of hearing the same story told over and over again, like listening to their uncle retell stories from way back when. That’s not what I think is going to excite people. I think people should be excited to learn how Elvis is so relevant to our contemporary moment. Elvis is a living, breathing phenomenon of American life. We need to love and understand it if we can love and understand ourselves. It was for that reason that we took his 1963 Rolls Royce all the way across this country. I’ve driven about 25,000 miles in Elvis’ car to get to the seat I’m sitting in right now, going to all of the places that were his milestones along the way. None were more significant than Memphis, but there were milestones from Tupelo to Memphis to Nashville to Detroit to Los Vegas, Los Angeles, and countless points in between. The goal was to capture two things at the same time: a loving and deeply compassionate look at Elvis as a man, and a loving and deeply compassionate look at the country he left behind that is in great pain today—as Elvis was once in great pain. 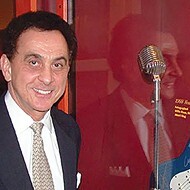 Jerry Schilling, Elvis’ best friend, and George Klein are both in the film. Along with other friends of Elvis, they talk about how hard they tried to save Elvis from the seductions and demons that were collapsing upon him. I believe I’m trying to do the same thing for America. Elvis in the film is a metaphor for the American people. I believe the American people have been hurt and undermined by power and money, and the incredible influence they have over American life. The .001% are getting away with murder, and everyone else is suffering and barely making ends meet. Elvis likewise was deeply, deeply undermined by the enormous power and money that arose around him. It happened just like it did for America. It happened because we were so beautiful, because we were so special, because we rose too fast. We had too much power before we knew what to do with it. As with Elvis, and it happened to us, he reached out to all kinds of quick fixes address those demons and seductions, and it just got worse. America is the most addicted, the most heartbroken country you could imagine. There’s a reason we took the Rolls Royce, and not a Cadillac or Thunderbird. Those cars are great, and I love them. They connote a wonderful former time. But I didn’t want to give people more Kool Aid to drink, about how it was so great once upon a time. Democracy’s a struggle. It’s always been a noble struggle. It was a struggle for the Founders to dump that tea in the harbor. It was a struggle to fight the Revolutionary War. It was a struggle to fight World War II. Anyone who thinks that the maintenance of democracy is going to be easy is in for a rude awakening. I think that the hard work of democracy means looking at yourself honestly, and going about fixing what is wrong. That’s why the Constitution has amendments. We look at ourselves. We look at the heart and soul of the country, and if we believe in her enough to show true love, tough love. My movie shows tough love to Elvis, because unlike the usual sugar coated hagiography, this movie shows what Elvis was struggling with. It doesn’t blame him for that struggle. It shows compassion to him. If I could have done anything, I would have helped Elvis get free of that which is damaging him. I want to do the same thing for this country. I think Elvis can serve this country in death as magnificently as he did in life. He inspired and uplifted the country in life. His passing should have been a cautionary tale about how things can go wrong if power and money prevail. I think the lesson of his passing, which should not have happened, and which happened prematurely, gives the country an incredible way of looking at itself. We can look at ourselves and get out from under the power and the money. There are going to be people who fear that the movie is going to be an attack on Elvis. Those are people who haven’t seen the movie. They might hear that Chuck D is in the movie, who once called Elvis a racist in “Fight The Power”. You need to hear what Chuck D has to say about Elvis in this movie. It will surprise them. It’s quite historic. It’s not what they expect. You will not find a more loving person toward Elvis than Chuck D. If that sounds surprising, watch the movie. He’s the one who comes out and says yeah, Elvis always chose the money. How did you find people to be in the movie? When I told people I wanted to drive Elvis’ Rolls Royce across the country, many people wanted to be in a movie like that. This movie was not made about the current president, whose name I don’t use in interviews. This movie was forged in a 2014 timeframe, looking at a country that, under a Democratic administration or a Republican administration, either way was so far from our founding principles, all that made us great and beautiful. You know, Jeff Bezos of Amazon makes $1.2 million an hour. Stop and think about that number: $1.2 million an hour. Now imagine how much the guy cleaning up the dishes makes per year. Ask yourself, when we read the Constitution as children, when we read our textbooks about equality before the law and equal opportunity and all the values that make our country great, that are so fundamental to the American dream. Imagine if you could fast forward yourself ahead and showed yourself Jeff Bezos making $1.2 million an hour, and learn that’s not exceptional among the top 0.001% of this country. They are running this country like their personal playground, and everybody else is struggling to get by. That is an inequity that I believe is un-Christian, un-American, immoral, and not sustainable. It’s an emergency. We need to break this up and intervene. The American people ourselves need to say, forget Washington, forget the people who supposedly lead us. We need to get together and decide what kind of country we want to live in, just as Madison and Jefferson did, just as the framers did. They knew. They were living in a time when the 0.001% were running amok and getting away with murder. They thought, we’re not going to stand for it. The movie is a call for that, but not because Elvis is a political person. Elvis lit the world on fire as a poor person. He showed the beauty and the majesty of a poor person. I want the majesty and beauty of poor people to be dignified in this society. I want to see them stop being trampled by the prerogatives of the 1%. I believe those who package Elvis as a brand to put on your kid’s lunchbox, or a tshirt, are cheapening Elvis. I think Elvis stands for something much deeper, something akin to Lincoln or Herman Melville or Emily Dickenson or Franklin Roosevelt, or even Teddy Roosevelt. I think that Elvis stands for something about how America became what it is, in the best sense. What he symbolized, in the best sense, was to say to so many people, if he could make it, they could make it. That’s the majesty of Elvis Presley. To see that chewed up and spat out by the forces that used Elvis…so many forces that acted as parasites on him. We need to see ourselves as Elvis. Inside each and every one of us, we have that idealistic dreamer who should have a chance if we’ve got the talent, and we’ve got the story, and we’ve got the authenticity. Until we make that our priority, and stop watching the royal wedding on TV, and stop putting Bill Gates and the current president up on a pedestal, we are going to keep asking ourselves where our democracy is going. And where it’s going is out the hole in your brain where everything is leaking because you got so obsessed with power and money that you forgot that the whole point of this country was to be a revolution against power and money. The reason I called the movie The King, and the reason we drove the Rolls Royce instead of a Cadillac or Thunderbird, was because the Rolls Royce was a symbol of Elvis getting lost. Country boys shouldn’t become kings. Kings are the opposite of country boys. Country boys should become famous, they should be loved, they should stay with their family, they should have a family, they should embody family life. They shouldn’t be a lost king, drugged and confused and hurting in the back of a car so big they can barely see out the window. That’s not the fitting outcome for a person like Elvis Presley. We drove the car across America as a symbol of what’s wrong with becoming a King, what’s wrong with royalty. I believe in of the people, by the people, for the people. I do not believe in royalty. 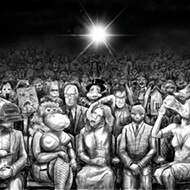 I have a friend, Adam Remsen, who made a short film several years ago. The King kept reminding me of it. He didn’t use any Elvis music or anything. He just used public domain footage of NASA rockets launching and blowing up over a three minute monolog about how Elvis was the monkey in the space capsule. Nobody had ever been there before. Emmylou Harris says that in the film. He was the first, and our hearts have to go out to Elvis. Nobody had achieved that kind of supernova fame before. Nobody had that kind of power and money made available to them. Linda Thompson, at one point in the film, says when she was dating Elvis, every thirty seconds somebody was coming to him and saying, “I want to be with you.” Imagine what that does to your concept of intimacy. I don’t blame Elvis. I don’t think I could have withstood a fraction of the seductions that were placed before him. I can’t even put Facebook down. 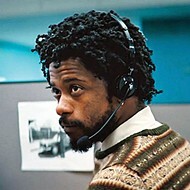 You think I think I’m superior to this guy because he couldn’t get off Dilaudid? Because he couldn’t say no to incredible contracts in Hollywood and Las Vegas? Those who try to pretend these issues away when they present Elvis do two things. They mislead the American people about how they should understand the struggles of our heroes, and thus understand ourselves. Every person around us is an addict in some way. Every person has a struggle. They shouldn’t be belittled by the perfect Elvis. They should see the struggle that every human has. And frankly, they lose the younger audience, because they don’t buy this image of the perfect Elvis on the lunchbox. They’re too smart for that. If this is a movie about trying to wake us up, about trying to break us out of our collective fascination with ourselves, what is our prescription? Where do we go from here? How do we avoid ODing on the toilet? It’s a very interesting time. It’s the worst of times, best of times. I watched Congress almost have a fisticuffs brawl yesterday because the corruption in Washington is so thick. It’s on full display for the American people. We now have a leader in office who is a brazen predator capitalist. He has been put into an office that my child is supposed to look up to for the first principles of the United States of America. I thought those were of the people, by the people, for the people. Checks and balances. Separation of powers. If you look at the Oval Office, you have a person in there who doesn’t believe in the separation of powers, who doesn’t believe in checks and balances, and he certainly doesn’t believe in of the people, by the people, for the people. He’s a creature of wealth. He was born rich, and he plans to stay rich and keep other people from being rich. These are crisis level problems. I’m not a democrat. I’m in neither party. This is a bipartisan disaster. Those of us who are the American people, who are purple people, we need to figure out what kind of world we want to live in and what we’re doing to achieve that kind of democracy. But there’s good news. On his watch, whether he knew it or whether he didn’t, and I’ll say he didn’t. His grotesque disregard for the dignity of the presidency and the county has produced such outrage that inspired some of the most significant social movements of my lifetime. Me Too, Times Up, the students from Parkland—whether you believe in more gun laws or you don’t, you cannot doubt that those young people are standing up to one of the most powerful institutions in American history, because they believe they are morally right by standing up for their fallen comrades. They’re saving their families from absolutely insane gun violence that is unique to this country. Look at the teachers who have struck to get better conditions for our children. Look at the sanctuary cities that have been created to keep America an admired haven for the world. There are so many directions where we see demand for reform, that even a jaded person who has given up on everything has to say, well, this place was formed by people who stepped up against the British crown. If we’re seeing this place descend into monarchy and fascism, corporate control, a disempowerment of the people, then the people are rising up and saying, we are the lifeblood of this country. We built the railroads, we built the cities, we fight the wars, we pay the taxes. Is someone really going to say to those people shouldn’t do that? Now we’re all in this together. That’s an amazing moment to be alive. It may have taken a very, very dark chapter in American history to awaken a wide swath of the American people, but it's happening.